These stylish harem shorts are soft, loose fitting and made from light breathable material for optimal comfort. Wear these with a basic top to achieve the perfect bohemian look when going for a walk or an adventure in nature. The one of a kind style of the lightweight fabric allows for maximum comfort on those hot summer days or on a cozy day at home. They’re also very well suited for a run, a workout or a day at the beach. 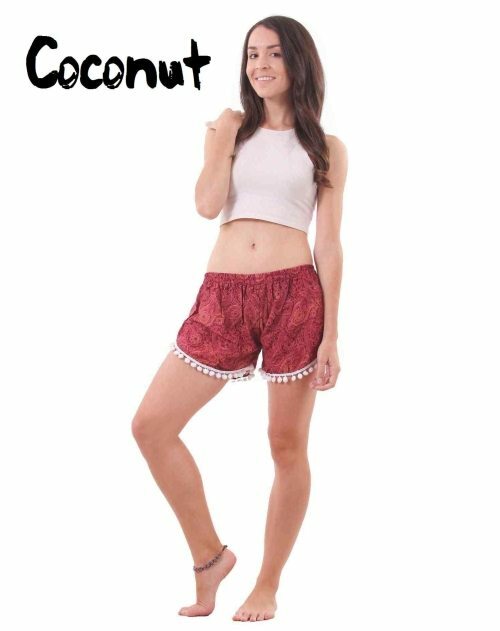 The prints and colors come in both paisley style patterns with soft white beads at the end of the leg and more traditional elephant style shorts. Both of which are worth showing off to your friends! They’re handmade with a stretchy elastic waistband for added comfort. So very cute and comfortable, these harem shorts for women are going to end up as your favorite pair of shorts this summer.